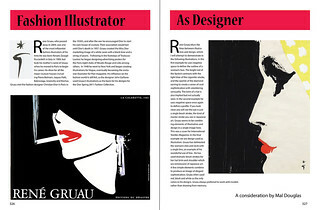 This is a faux article on the fashion illustrator Rene Gruau. He is my inspiration for Graphic Design. I feel that many of his illustrations were almost pure design and I believe the two I have chosen exemplify this; negative space is used exclusively to define form. His main colors were red, black and white and these are echoed in my article. This entry was posted in Graphic Design I and tagged Designer, Fashion Illustrator, Rene Gruau. Bookmark the permalink.